Steering at the big screen my eyes were very focused and I was amazed at what those artists could do. They were very talented with using spray cans and some other paint. The videos are on the Room 16 Site. I said to myself ,“Man he's good at that”. So I wanted to be an artist and suddenly I am. Are you an artist? If you are then why don’t you draw it or paint it and then sell it? Good luck with your drawing! I know you guys can do it. It looked so good that I had to put it on my blog. It looked so cool once he had finished it. Thanks to you all who are reading my blog! 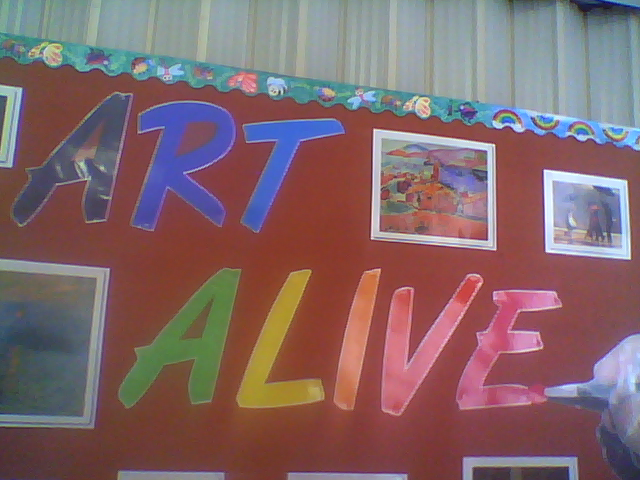 Hi Levi I liked your story about Art Alive. It is a great theme because drawing is my favourite thing to do. By the way you got the first word in (Steering) wrong. Any way keep up the good work. From Uili. Nice blog, son. I've never been good at art but I love to draw anyway. Looking forward to seeing some of the pieces that you'll be doing this term.